The ReSharper 3.0 EAP has been in progress for about two weeks now. 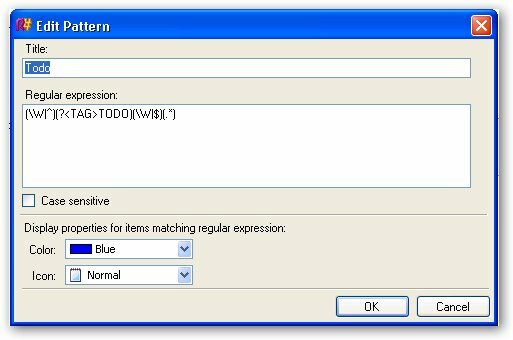 This is the first post in a series that will look in detail at some of the new features that will be available in this latest version of ReSharper. 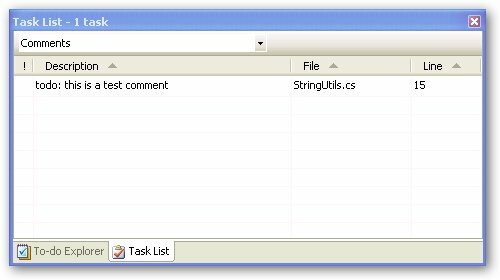 In Visual Studio.NET 2005, you can use the Task List window to show comments with the keyword todo in it. However, this only works with files that are open in the IDE; it’s not going to show you TODOs in other parts of your solution that you don’t currently have open, or any other keyword EXCEPT todo. In ReSharper 3.0, you get the much more useful To-do Explorer. When you open this window (found in ReSharper -> Windows -> To-do Explorer), by default you see a solution-wide listing of all comments with the prefix NOTE, TODO or BUG. The default keywords that the To-do explorer looks for can be changed or added to by clicking the â€œTo-do settingsâ€ icon in the window. You could add a pattern to match the keyword â€œPROJ-####â€ and see all JIRA tickets mentioned in your code. These To-dos can also be exported to a text file and can also be grouped to make the To-dos easier to read, so you can find which projects, namespaces, directories, etc … contain To-dos. This is a nice feature which could be very useful, if there is a way export the completed work items (for subversion commits). I would be much more impressed by a blog post about support for the new Orcas language features. Where’s the beef in the 3.0 release if I’m not stuck in Visual Basic world? This isn’t correct. The keywords “hack”, “undone” and “todo” are predefined, and you can add/customize keywords using Options -> Environment -> Task list. The requirement that files must be open is a huge drawback though, and I’m looking forward to try your implementation. I dont believe there is any way to track “completed” work items with the to-do explorer. However, off the top of my head, you could always export the outstanding todos to an xml file, commit that to SVN and then DIFF the files every time you want to see what’s changed. Good catch on Visual Studio’s task list keyword customization. Will ReSharper 3 support .NET 3.0 in all its XAML goodness? Dmitry, according to the ReSharper 3.0 EAP roadmap, there is basic support for XAML already. I do not know if the plan is for full XAML support in 3.0, but you can probably expect more XAML support to be added in the near future. 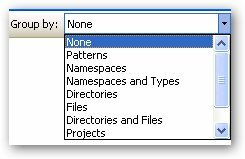 I don’t know if this is the right place to post this, but I’d love it if Resharper 3 gave us full text search on all files in the loaded solution. hey andres, what full text search are you talking about?